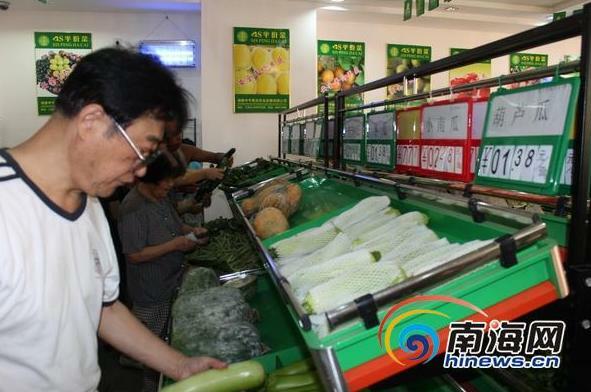 Sanya opened its first 4S fair-priced vegetable store in 3rd March, 2012, which is very popular among the consumers. Sanya Zhongping Joint Agricultural Development Co. plans to open 2 more fair-priced vegetable stores in downtown area by 1st May this year. In addition, they will invest 10 “vegetable through trains” to communities to better service Sanya residents. Most shoppers show positive attitude towards the consumption modes of the fair-priced vegetable store, they think it really benefits people. The first 4S fair-priced vegetable store covers more than 200 square meters. It provides more than 60 fresh vegetables and fruits which meet the demands for 2000 shoppers every day.